Martin Yate, "Knock 'em Dead - Secrets and Strategies for Success in an Uncertain World"
"Whether your concerns are landing the job you want, choosing or changing careers, shoring up job security, climbing the professional ladder, or owning your own business, Martin Yate's Knock 'em Dead: Secrets & Strategies for Success in an Uncertain World is the career book of the year. Bet on yourself. Read it." Finding a new job or a new career has never been more challenging. What if you could put your uncertain future in the hands of the global thought leader on job search and career management? Today you can! Martin Yate takes you on a journey of discovery that will change the trajectory of your life. 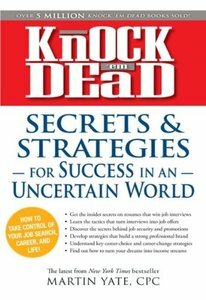 Starting with proven strategies for winning your next job, you learn how to successfully navigate the twists and turns of your entire career. Plus, he brings along some of America's smartest recruitment and career management minds to join the conversation. Whether your concerns are resumes, job search, turning interviews into offers, job security, climbing the ladder of success, choosing or changing careers, pursuing your dreams, or owning your own business, here's an integrated blueprint for success. With this guide, you have everything you need to take control of your job search, career, and life. Lots of books tell you to pursue your dreams; this one tells you exactly how to make it happen.